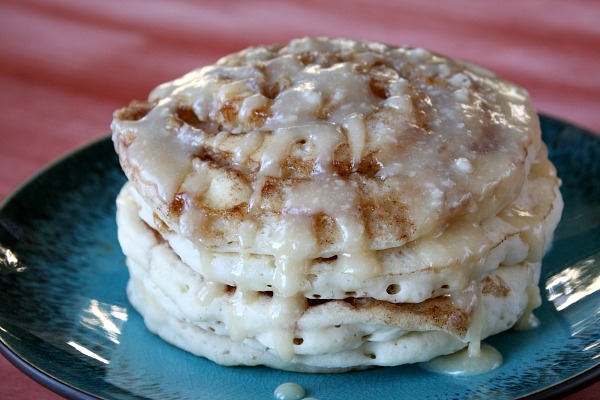 My Mom’s original Cinnamon Roll Pancakes on her blog were a hit, so why shouldn’t my adapted version of them be just as good? 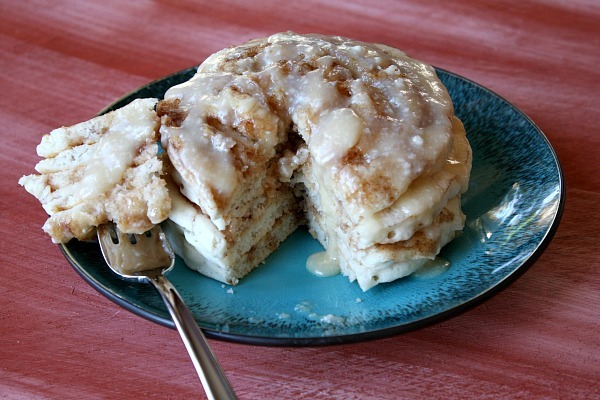 I made YUMMY Maple- Cinnamon Roll Pancakes that were devoured in my house. The Lange home’s residents have a voracious appetite. What more could go with these pancakes than a maple cream cheese drizzle? Now that is exactly what one stack of tricked out pancakes looks like. 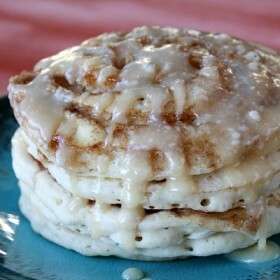 For this cinnamon roll pancake recipe, I included maple INSIDE the cinnamon swirl and also in the cream cheese drizzle. 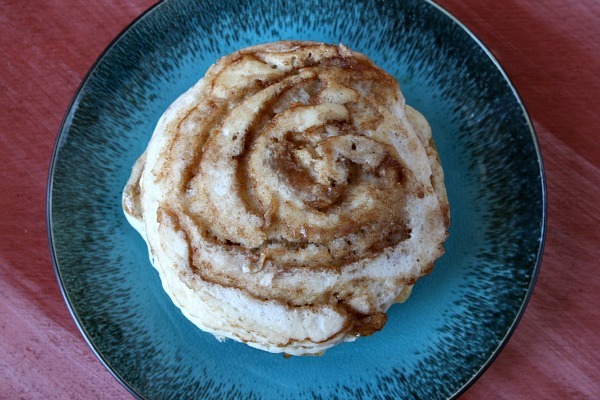 When you put the cinnamon swirl on the pancake batter, you have to get creative. On my first few tries putting the cinnamon swirl on the batter, I FAILED. I just wasn’t good at it at all. Then I tried to make a face like the “man in the moon” and it worked! Well I had my fun so my mom intervened and showed me some tips on the swirling part. 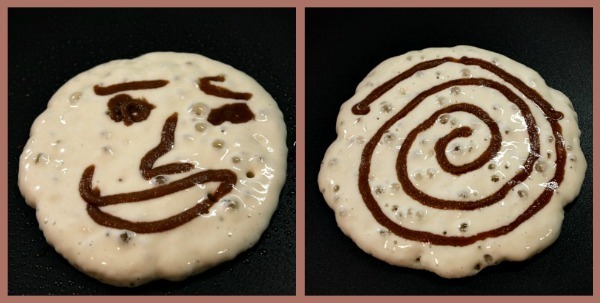 But then, I made a pancake (top right photo) that was better than all of mine or my mom’s. It was my “Perfect Pancake.” The “Perfect Pancake” had a perfect swirl with cinnamon in every place that I needed it in. “Huh? This is what my “Perfect Pancake” looks like?” I was asking to my mom after it was done cooking. My mom told me that all Cinnamon Roll Pancakes look like that after they’re done cooking and I suddenly felt so relieved, my head hurt (and with all of the stuff that I do I need to be careful not to get injured! My sport’s teams need me). We all thought this recipe tasted more like a dessert than breakfast but we still loved it. The drizzle really jazzes these pancakes up. It adds a little more of that tasty maple kick. This sight shocks me. How can pancakes be SO good? The maple cream cheese drizzle definitely gives this recipe an flavor boost. I LOVE the cinnamon roll and maple combo too though. 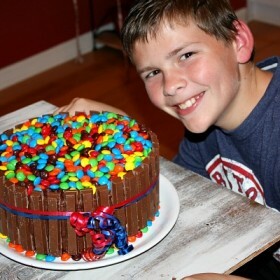 And even a kid can adapt his Mom’s recipes… Like Me! Um, pretty much the best pancakes EVER! 1. Prepare the cinnamon filling: In a medium bowl, stir together the butter, maple syrup, brown sugar and cinnamon. Scoop the filling into a quart-sized heavy zip baggie and set it aside. 2. Prepare the glaze: In a small pan, heat the butter over low heat until melted. Whisk in the syrup and cream cheese and continue to stir until melted. Turn off the heat and sift the powdered sugar into the pan. Stir until smooth. 3. Prepare your favorite pancake mix as directed on the box (just to the batter stage). You don't want the batter to be too thin. 4. Cook the pancakes: Heat a large skillet or griddle over medium heat. Spray with nonstick spray. Use an ice cream scoop (or 1/3 cup measuring cup) to add the batter to the pan. Use the bottom of the scoop to spread the batter into a circle (about 4 to 5-inches in diameter). Reduce the heat to medium-low. Snip the corner of your baggie of filling and squeeze the filling into the open corner. 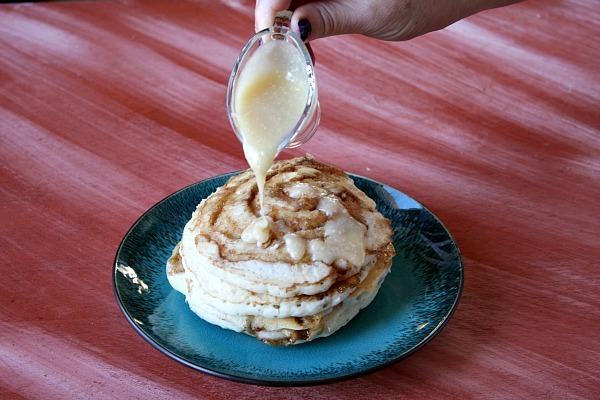 When the pancake begins to form bubbles, squeeze the cinnamon filling on top of the pancake batter in a swirl. Cook the pancake until the bubbles begin popping and it is golden brown on the bottom. Slide a thin spatula underneath the pancake and gently but quickly flip it over. Cook an additional 2 to 3 minutes, until the other side is golden as well. 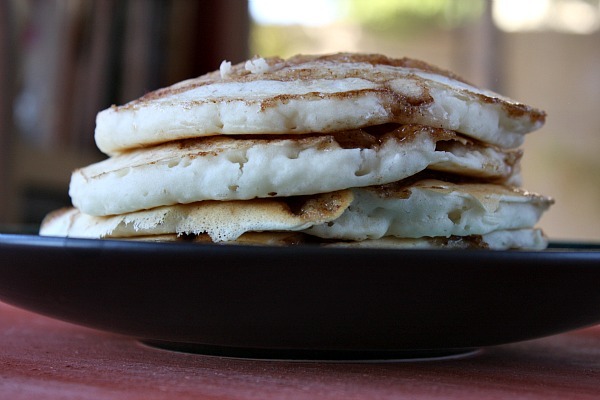 Wipe out the pan with a paper towel and repeat with the remaining pancake batter and filling. 5. Serve pancakes topped with a drizzle of warm cream cheese glaze. I love this maple version! Yum!! 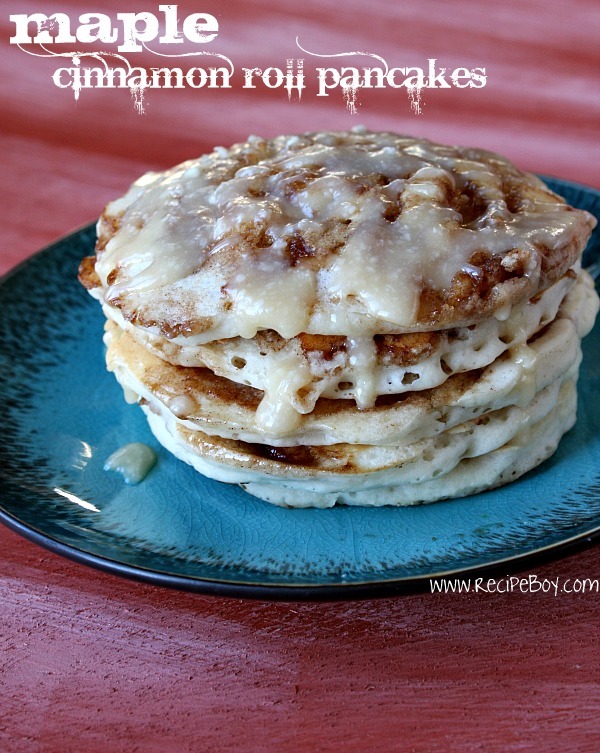 Cinnamon Pankcakes are my favorite!I love cinnamon rolls too! 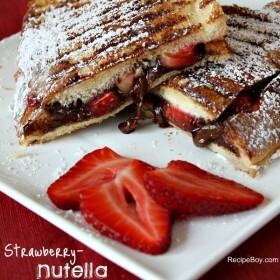 So I know I need to make these soon! WoW what a Great idea. Short of adding some chocolate chips it never occured to me what else I could do to the pancakes! Nothing better than maple flavoring with cinnamon. I love these, and the smiley face is adorable! This looks oh so sweeeet. Bet you couldn’t wait to to eat them up! I’ve got to make these…looks too good to pass up! What kind of pancake mix do you normally use or recommend? I prefer not to use a mix because it doesn’t taste as good. Plus it’s really easy to make your own pancake batter.